And so with issue number eight, a fantastic story about the fate of humanity, bravery, and love ends. Trillium is a special book, one that deserves to stand among the best that this medium has to offer. This is no ordinary comic book tale, rather it is an epic story about two star-crossed souls whose destiny is to unite across space and time in an effort to save the very last souls of humanity from extinction. But the beauty of this book is the fact that deep down in its core it is a love story. 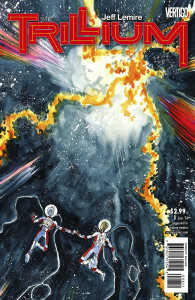 Throughout this run, Jeff Lemire has found ways of transcending the norms of this medium to deliver a book that is totally unique. I have never read a story like this before and in the end, I am all the better for reading it. I have praised the art of this book many times before, but I have to give it one last hoorah; this book is beautiful. 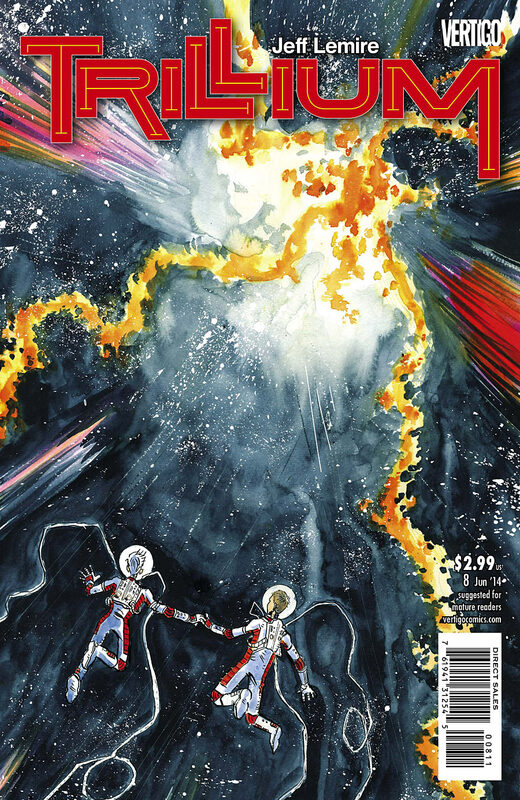 Love him or hate him, Jeff Lemire’s art style is a perfect marriage for this story. The washed out water-color style and sketch-like drawings convey the subject matter perfectly. In a story that takes us through such intense mindscapes, alien worlds, and black holes, the art more than holds its own. I can’t imagine this story being told any other way. When it’s all said and done, we have a story that lives up to everything that it was meant to be and more. If you haven’t been reading this story, the trade comes out soon. I highly recommend it.